What Is the MSN Nursing Capstone? The Master of Science in Nursing (MSN) requires a nursing capstone project that showcases the application of a student’s knowledge and skills. Its purpose is to show that a student has mastery level understanding of your undergraduate and postgraduate nursing school program coursework. 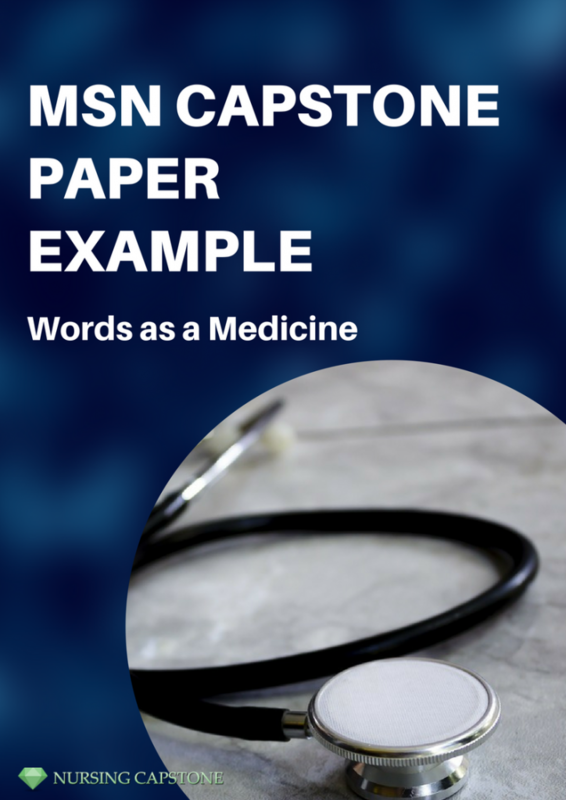 This guide is a great place to start if you are needing capstone help and examples of MSN capstone projects. Why Do Nurses Need to Write the MSN Nursing Capstone Project? Nurses need to write an MSN nursing capstone project in order to complete their graduate coursework. If you are already a registered nurse (RN), you may choose to complete the program for an advanced degree. Nurses in advanced programs typically go on to work in positions such as nurse anesthetist, midwife, or nurse practitioner. Additionally, if you are completing a Doctor of Nursing Practice or DNP degree, completing the MSN nursing project may be required. How Long Does It Take to Complete the MSN Capstone? The time it takes to complete RN to BSN capstone or any other capstone project will vary from school to school; however, the project is usually around 10 weeks long. This sometimes takes two semesters depending on the amount of rigor the project requires. Students often take a semester-long course that helps guide them through the process. The MSN capstone consists of a capstone project and a written paper. The capstone project is the presentation portion of your project and addresses the tools used, methodology, and analysis of results. The paper will go more in depth about the project and outline your objectives and relevant data. If you are just beginning your graduate studies, think about MSN capstone ideas early. Procrastination never yields positive results. Consult professors and instructors within your field to start formulating ideas. Making these kinds of connections early can benefit you in the long run and help you build relationships with your supervisors. It never hurts to show that you are dedicated to the project. Introduction – Paragraph that introduces your thesis, findings, and methodology. Theories and Hypotheses – Explain any theories or hypotheses consulted in your research. Give relevant samples of graphs and other data. Scholarly Literature Review – Add this as a short section within your proposal. This will provide an overview of current information on your chosen topic and give more context to your research. Research Methods – Explain how you will research this topic. Proposal Alternatives – Suggest possible proposal alternatives in case your main proposal is rejected by your advisor. It would be helpful to choose alternatives that are related to your first choice project. If you are unsure where to start, check out our nursing capstone ideas in one of the sections below! 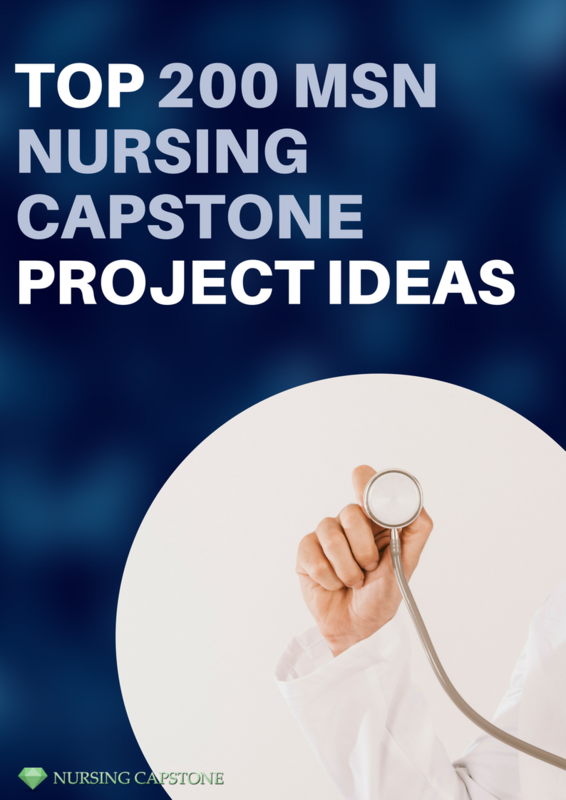 The actual examples of capstone projects for nursing are similar to what you submitted for the proposal; however, the paper will be must longer. Introduction – Include your thesis and outline any issues when addressing your topic. Explain how you will overcome these in your research and why you chose these approaches. Literature Review – Mention all sources and authors that you consulted in your research. Provide comprehensive context and details behind your research. Methodology – This includes all your research methods, data collection, and instruments used. Make sure to explain why you chose the methods and instruments you did. Conclusion – The conclusion develops the analysis portion of your paper with future recommendations for research and real-life applications. DOWNLOAD PDF below to see the full version! Consult your advisor: Don’t be afraid to ask your advisor for help. They are experts in the nursing field and have even written a capstone themselves! They can even provide you with an example of a MSN capstone paper. Good thesis statement: Your thesis statement must be compelling and encourage your reader to engage with your project. Read the paper aloud: This can help to make sure that the sentences flow and that your transitions work well. Formatting: Make sure that the correct formatting is used. Do not use unnecessary terminology: Use clear and concise language. Using unnecessary terminology can cloud your paper and confuse your reader. Correct grammar check that there are no spelling or syntactical errors within the paper. Proofread: Have another friend read over your paper to check for succinctness and cogency. Ask other students: Reach out to other nursing or WGU students and see if they have helpful insight. Creating a study group can help build relationships with your peers and improve your writing skills. Resources: Cite your sources properly in the correct format outlined by the instructions provided by your supervisor. You may be using the APA or MLA Style format. Hire a reputable company to help you write the paper: Call or email the experts at Nursing Capstone if you are needing more assistance. Send us your instructions set by your college and advisor. Capstone projects vary from school to school. Providing us with the instructions ensures that all your needs are met. You’ll get the first draft in no time! Reply with your remarks and we can make the necessary changes. We’ll definitely get it right the second time! You’ll receive a perfect final result. Don’t stress about your MSN capstone in nursing. Call us to get started today!